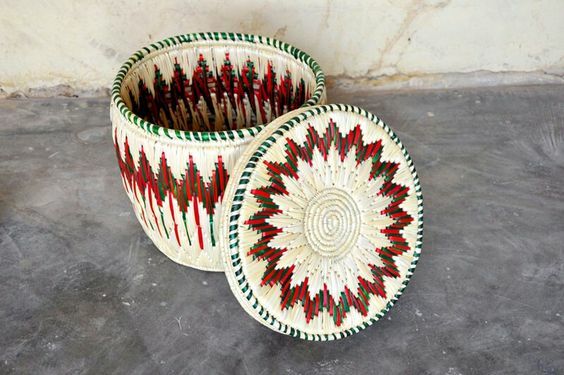 Uttar Pradesh has a tradition of making baskets for everyday uses and for special occasions by coiling the outer layers of the grass called moonj. This craft is practised mostly by women. Moonj and rara are types of wild grass which grow near the banks of the rivers around Allahabad. Moonj is outer layer of the grass which is peeled and knotted. This art is been practised from the last 60 to 70 years. 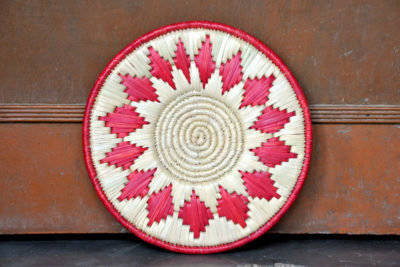 The motifs of basketry are created by adding colored grass in between. The Moonj coiled grass products are ideal to serve daily life purposes. These natural products can be used as containers, food storage devices and wall decorators. The products are very simple, attractive and eco-friendly. Coiling is a basketry technique used by rural women in Allahabad, Behraich and Gorakhpur districts in eastern Uttar Pradesh to make objects for use in the kitchen. The baskets are used in the kitchen for storing flour and foodgrains. Food, especially rotis, flat bread, stored in them stays fresh.Special baskets with shell tassels are made by a mother for her daughter’s marriage. The baskets for daily use are simpler and smaller. 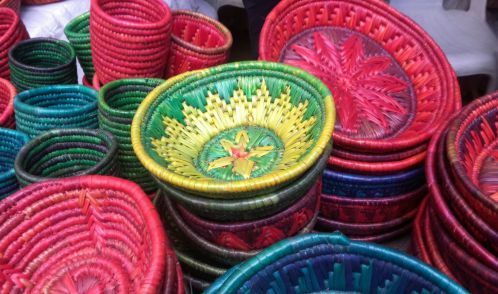 For the craftswomen of Allahabad, basketry earns a living unlike in the other villages where it is a domestic craft. The baskets of the Tharus of Behraich can be distinguished by their bold forms and stylized animal and human motifs. In Gorakhpur, the women coil large beautifully patterned maunis, circular baskets with large mouths and convex bottoms that are laid in a row for the bride to step in as she leaves her home. The bride takes some with her, laden with grain, sweets and other gifts. The baskets are made from moonj and rara, a type of grasses that grow wild in wastelands. Moonj baskets are lightweight and weather very well.The moonj is harvested in winter and the peel of the stalks left out in the dew for about 3 days, for the colour to lighten. Some splits are dyed in bright colours to pattern the baskets. The twining of the baskets these days is being done with material like colourful plastic strips, tinsel and cloth. They are so tightly coiled that they are almost waterproof and long-lasting. This craft is practised mostly by women. The women gather raw materials from the factory and make products at their convenience after they finish daily chores. This craft has been passed down across the generations that have kept it alive. Also, the craft has traditional significance as the products are given as gifts to women in ritual functions and weddings. The art of basket weaving is as old as pottery. The ancient nomadic food gatherers wove reeds together to prepare baskets to hold their food or other collectibles. Later, with the advent of different cultures, basketry took shape both for daily use and ritual purposes. Special patterns have evolved according to local traditions and techniques. Though the process involved in creating these products hasn’t changed over generations, but natural dyes are being used now to make them attractive. Originally, the colours were hardly used , but today if the item has to look impressive, bright colours which are natural dyes are generally preferred. While the most popular products include baskets, tablemats and containers, new designs include earrings, fruit baskets and hand purses. They are priced between Rs 500-3,000. It’s a one-piece craft. Once a certain type of design is made, it can’t be exactly replicated which becomes difficult in case of bulk orders.